SANTA FE – Hunting seasons are underway and the New Mexico Department of Game and Fish will be conducting roadblocks throughout the state during fall hunting seasons to collect harvest data and to detect wildlife law violations. Conservation officers may be assisted by other agencies such as the U.S. Forest Service, Bureau of Land Management, New Mexico State Police or county sheriff’s offices. As a result, the public may encounter minor delays. At roadblocks, conservation officers also will check for compliance with the Off-Highway Motor Vehicle Act. Drivers of vehicles hauling wood products will be asked to produce documentation as required by the Forest Conservation Act. Everyone is encouraged to report any violations they may observe, such as shooting from a vehicle, spotlighting or driving off-road. 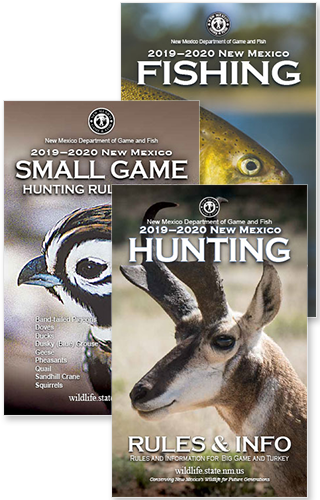 For more information, please consult the department’s hunting rules and information books, available at www.wildlife.state.nm.us or at area offices and license vendors. To report a wildlife-law violation, please contact a department area office in Santa Fe, Albuquerque, Raton, Roswell or Las Cruces or call the toll-free Operation Game Thief hotline at (800) 432-GAME (4263). Callers can remain anonymous and earn rewards for information leading to charges being filed. Violations also can be reported online at Operation Game Thief.